Although not as well attended as last year, there was still a good number of entries in all sections, considering the atrocious weather on the preceding days when everyone would have been preparing their entries. We had two cups to present, one for Home Produce and the other for overall performance. Both cups were presented by Maureen Kells, Chairperson of the Garden Society, to Moira Rodgers from Rawbrae Road. As many of you will know, Moira was our Chairperson for several years. She achieved 11 firsts in the horticulture section and 4 firsts in the Home Produce section. Whgere there was a close runner up in Mrs Brennan with only 2 points separating them. Although we have no cup for 2nd place, we offer her our congratulations and thank her for entering. , these two were very close with only one point apart. In the children’s section, Jay McQuarrie was in 1st place for her “posy in a mug” and also 1st for her bookmark. Other places in this section were covered by the Rodgers family 2nd for Neil, 3rd for Anna with Mikey being “highly recommended”! The painted stones were covered by the Woods family with Anna 1st, Libby 2nd and Rory 3rd. All the children were presented with various packets of seeds which we hope will encourage their green fingers to grow! A tasty lunch of soup and sandwiches was served up to society members and the judges by Ann Kay and Rosemary Kinney. There was a choice of two delicious soups, both made for us by Olive Dooris, who recently joined the Society – we’re glad you joined Olive! Tea and coffee for the public was also handled by Ann and Rosemary. We would like to thank all who submitted entries, all who helped out on the day and all who attended and we look forward to your continued support. 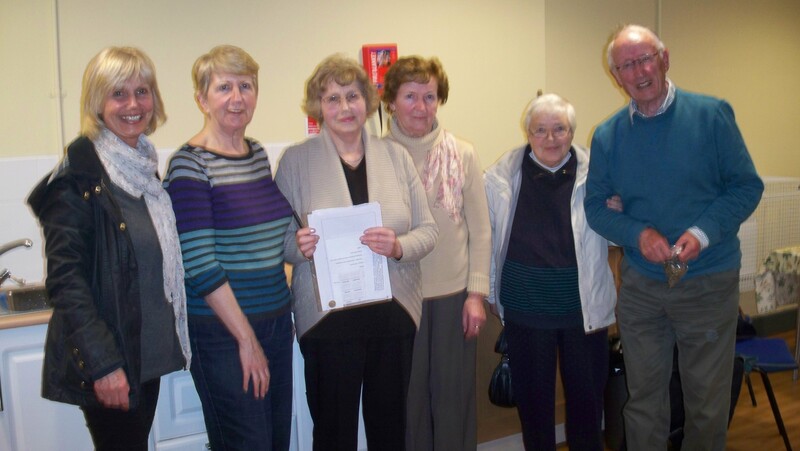 Meeting on 2nd September 2015 Our meeting on 2nd September at the Community Centre was well attended although a few of our regulars were still away on holiday, no doubt avoiding our wet weather! Our speaker was Keith Crawford who many of you will know from his contribution to Gardeners Corner on Radio Ulster where he deals with questions from listeners on air, so he was well able to answer our gardening queries – except how to deter rabbits! A problem that has increased for many of us over the last year. Keith encouraged us to “plant for the future” by planting beautiful trees that will not mature in our lifetime. If our forbears had not been so far sighted, we would not have some of the lovely gardens and parks we have today. However, no point planting large trees in a small garden so always find out what size trees and plants will grow to. So-called “dwarf” conifers can grow to 40ft or more. Even some shrubs such as Ilex Golden King (Holly) can grow to 40ft. Always plant for variety and contrast and don’t forget to consider scent. Keith brought along a fine selection of plants – some new varieties and some old favourites to grace our gardens at different times of the year. The evening was rounded off with our usual tea, coffee, biscuits and chat!